Violin Concerto In A Major, K. 219 (Urtext with cadenzas by J. Joachim, S. Franko, M. Wulfhorst). Composed by Wolfgang Amadeus Mozart (1756-1791). Edited by Christoph Hellmut Mahling. For violin and piano. This edition: Stapled, Urtext edition. Stapled. Urtext- und Interpretationsausgabe mit Kadenzen und Eingangen von J. Joachim, S. Franko, M. Wulfhorst. Classical Period. Difficulty: medium. Set of performance parts (includes separate pull-out violin part). Solo part, piano reduction and introductory text. K. 219. 69 pages. Duration 25m. 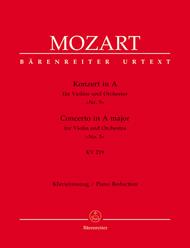 Published by Baerenreiter Verlag (BA.BA4712-90).ISBN 9790006453610. With solo part, piano reduction and introductory text. Classical Period. 9x12 inches.